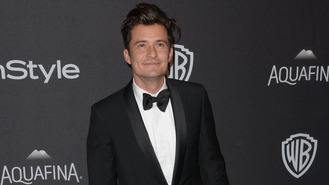 Orlando Bloom was apparently mesmerised by Katy Perry’s chest at a Golden Globes after party. The pair were seen putting on a public display of affection as they attended the Weinstein bash in Beverly Hills following the ceremony earlier this month (Jan16). And an eyewitness at the event revealed there were certain parts of Katy’s body that Orlando struggled to tear his gaze away from. “Orlando approached Katy and she was clearly thrilled,” a source told Britain's Heat magazine. “She was twirling her hair and he was leaning in close to whisper in her ear, with her kind of caressing him when he came towards her. “They went to sit down together and there was loads of touching on both sides. She was shrieking her head off laughing. It went on for at least an hour. The pair’s disregard for people taking pictures could be something to do with the fact that Katy wanted to get some “revenge” on former boyfriend John Mayer. The on-off pair had rekindled their romance just before Christmas (15), but things came to an end when John failed to show his willingness to commit to Katy once again. Singer Alicia Keys “was never the same” after she was exposed to people dying of AIDS in Africa. Tinie Tempah's third studio album is a "nostalgic" record. Adele has reportedly been asking Beyonce for tips on how to take her son on tour. One Direction star Louis Tomlinson's stepfather appears to have further confirmed his son is a first-time dad in a telling tweet. Beyonce is rumoured to be planning to release her sixth solo album in February. Shift K3Y is going into the studio to work with Craig David. Fans of Kesha are planning to show their support for the pop star as by protesting outside a New York City courthouse.